Echinacea can be used to help rid the body of both bacterial and viral infections, especially infections of the upper respiratory tract such as laryngitis, tonsillitis, and sinus infections. General blood purifier. Perennial herb that resembles a black-eyed Susan and grows 1-2 feet tall. Its sturdy stems are covered with tiny, bristly hairs and its pale to dark green leaves are pointed and 3-8 inches long. 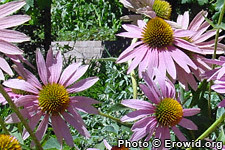 The large daisy-like flowers are pink or purple with petals arranged around a bristly central cone.